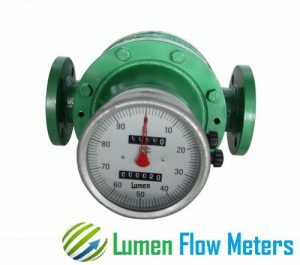 Positive displacement Flow meters are the types of flowmeters which are suitable for measurement of viscous liquid flows. These are also considered ideal for applications which require the use of a simple mechanical meter system. 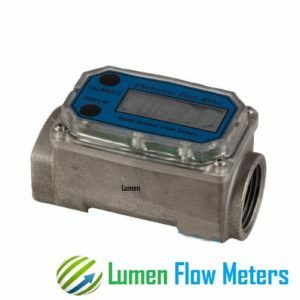 In general, a positive displacement flow meter consists of a chamber or cavity which restricts the flow. A rotating or reciprocating mechanical device is located inside the chamber to generate fixed-volume discrete parcels from the flowing liquid. Via PD meter units, liquids get separated into exactly calculated increments which are then further counted by a connecting register. Since every measured increment represents a distinct volume, these types of meters are widely used for automatic batching and accounting purposes. Positive displacement type flowmeters usually offer high accuracy i.e. about ±0.1% of actual flow rate sometimes. The metering accuracy of the unit gets better with the increase in the process fluid viscosity. 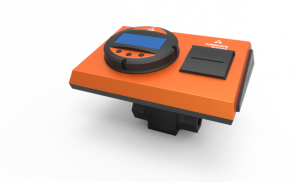 PD meters also provide excellent repeatability which can be as high as 0.05% of reading. PD meters can work without using a power supply. Moreover, they do not necessitate straight upstream and downstream pipe runs to install them. PD meters exist in size up to 12 in. Their turndown ratio can be as high as 100:1. Since PD meters have very small clearances between their precision-machined parts, rapid wear influences their accuracy. 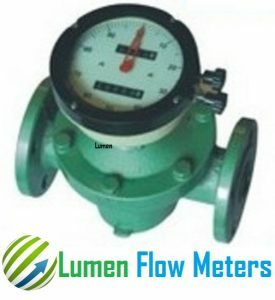 Therefore, these types of meters are normally not suggested for measurement of slurries or abrasive fluids. 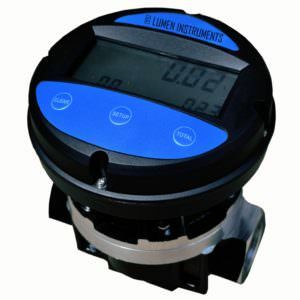 Positive displacement flowmeters are commonly employed as household water meters. The accuracy of positive displacement flowmeters depends upon the reliability of the capillary seal used to separate the passing liquid into discrete parcels. For getting the required accuracy and making sure that a PD meter works appropriately, a filtration system is needed. This filter system should be capable enough to remove large size particles as well as gas bubbles from the liquid flow. Positive displacement flowmeters work on a very simple operating principle. Positive displacement flowmeters consist of precision-fitted rotors for measurement of process fluid flow. Fixed volumes of liquid are moved between the rotors. The rotation of these rotors is directly proportional to the volume of the liquid being moved on. A central electronic pulse transmitter is included in a typical PD meter design which counts the number of rotations of the rotor. This counted number is then used to calculate liquid volume and flow rate. Rotor of a positive displacement type flowmeter can be constructed in numerous ways. Positive displacement flowmeters can be employed for nearly all nonabrasive fluids like heating oils, lubrication oils, polymer additives, animal and vegetable fat, printing ink, freon, etc.. These are also known as oscillating piston flowmeters. These are one of the oldest positive displacement type flowmeter designs. These types of meters are mainly of single or multiple-piston types. Other types available are double acting pistons and rotary pistons. Selection of a particular type of piston meter depends on the range of flow rates necessary for an application. Although piston meters are smaller in size and considered apt for handling only low flows of viscous liquids, yet they are proficient enough to deal with an extensive range of liquids. Major application areas of a reciprocating piston meter include viscous fluid services like oil metering on engine test stands, specifically where turndown ratio is not considered much crucial. Also, these meters can be employed on residential water service where they tend to pass partial quantities of dirt and fine sand along with water. These types of meters consist of two rotating, oval-shaped gears constructed with synchronized, close fitting teeth. In an oval gear meter, the rotation of gear shafts causes a fixed amount of liquid to pass through the meter. By monitoring the number of shaft rotations, one can calculate the liquid flow rate. These types of meters prove to be very accurate when slippage between the housing and the gears is set very small. Turndown ratio of an oval gear meter gets influenced by the lubricating properties of the process fluid. 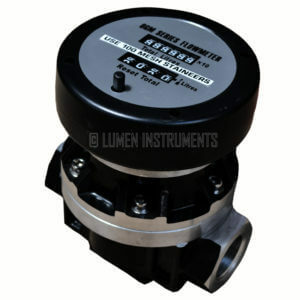 These are the widely used positive displacement type flowmeters. They consist of a moveable disk which is positioned on a concentric sphere situated inside a spherical side-walled unit. Universally, they are employed as residential water meters. They exist in various sizes and capacities and can be constructed from a wide range of materials. Their typical size range varies from 5/8-in to 2-in sizes. They are ideal for pressure ranges around 150-psig with an upper limit of 300 psig. These types of meters exist in different designs. However, they all work on the same operating principle. These meters basically include uniformly divided rotating impellers with two or more compartments inside the chamber. The number of rotations of the impeller are counted and recorded in volumetric units. These types of meters are frequently employed in the petroleum industry. Based on the construction material, maximum pressure and maximum temperature limits of rotary vane meters are 350°F and 1,000 psig respectively. Their Viscosity limit ranges between 1 and 25,000 centipoises. These types of meters are made up of two radically pitched helical rotors which result in an axial liquid displacement from one side of the chamber to the other side. Both the rotors are geared together and there is a very small clearance between the rotors and the casing. We are a leading Positive Displacement Flow Meter Manufacturers in India. We Export the flow meters to wide range of countries including UAE, Nepal, Canada. Dealership and Supplier Inquires are Welcome.